Molly and her littermate, Amber, were born to be sold, but congenital eye problems ruled that out. They were surrendered and ended up at Chihuahua Rescue & Referral in Federal Way, WA. The two dogs were placed in a foster home, and one day when they were outside, the foster caregiver witnessed a raccoon attacking Amber. Molly leaped into the fray to protect Amber, and the raccoon turned on her. By the time the attack was over, Molly, who was already sightless in one eye, had serious damage to her other eye. 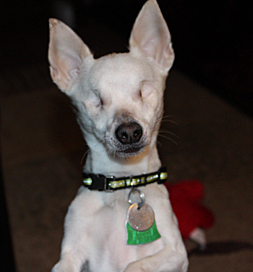 Molly, a blind Chihuahua, doesn’t let her condition stand in her way. The dogs were rushed to a veterinarian, but subsequent infection required that Molly’s eyeball had to be removed and, rather than leaving one sightless eye intact, the vet removed both. She was eight months old. One might think she would be relegated to foster care forever, but when she was 1-1/2 years old, Lorna Proctor saw her listed on Petfinder. The Marysville, WA, woman was looking for a companion for her toy poodle, and the fact that Molly couldn’t see didn’t bother her. She adopted the blind Chihuahua, and the dog fit into the family seamlessly. She sings loudly, shakes her dog toys, plays tug of war and steals her buddy’s toys. She’s mostly a dog like any other, blind or not. Besides being blind, though, there’s another way she differs, thanks to Lorna and her daughters. They take her to Chihuahua Rescue events where she serves as a charming advocate for special needs adoptions.